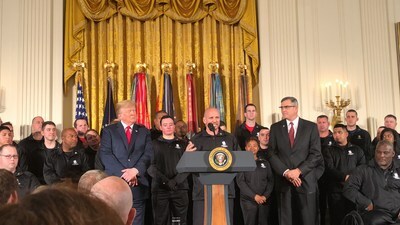 WASHINGTON, April 15, 2019 /PRNewswire/ -- President Donald Trump will welcome over 30 wounded, ill, and injured post-9/11 veterans served by Wounded Warrior Project® (WWP) to the White House Thursday morning. This visit is part of the annual Soldier Ride® in Washington, DC – a multi-day cycling event. Soldier Ride participants have visited the White House annually since 2008. Soldier Ride is one of the ways WWP empowers warriors to overcome physical challenges and discover a sense of community among their fellow riders. "Through the generosity of our donors, Wounded Warrior Project is able to collaborate with our nation's leaders on long-term solutions to overcome the greatest challenges America's service members and their families face," said Linnington. Since 2003, WWP has delivered $1.3 billion in programs and services to injured service members, veterans, and their families at no cost to participants. In addition, WWP works with our nation's leaders to improve the lives of wounded veterans and their families, advocating on their behalf. To learn more, visit https://wwp.news/Newsroom. Soldier Ride® is a Wounded Warrior Project® (WWP) program that empowers wounded veterans to become well-adjusted in body and mind, receiving the care they need to maximize rehabilitation and find strength through community. Read more at http://woundedwarriorproject.org/programs/soldier-ride.